Our bike’s quick releases are important safety parts. 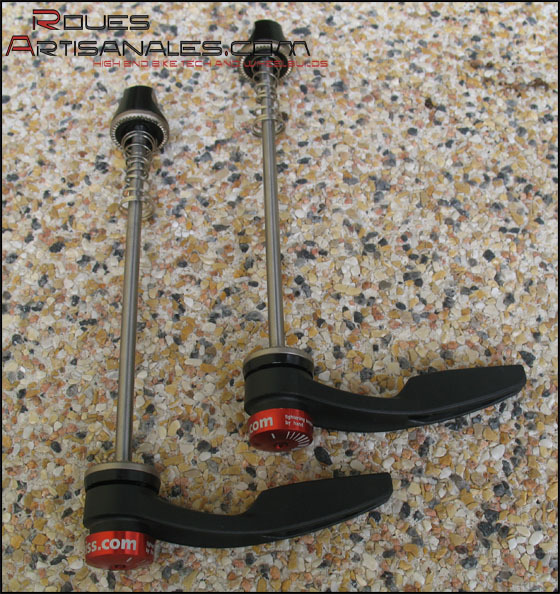 We can find them within a wide price range, made with different materials, offering more or less clamping strength. First of all, let’s look at the stress the skewers have to deal with. Which are these, where do they come from, what’s their relation with the hub and the bike? Whether it’s in static or in dynamic, the bike is suspended by the wheels through its hubs axis. 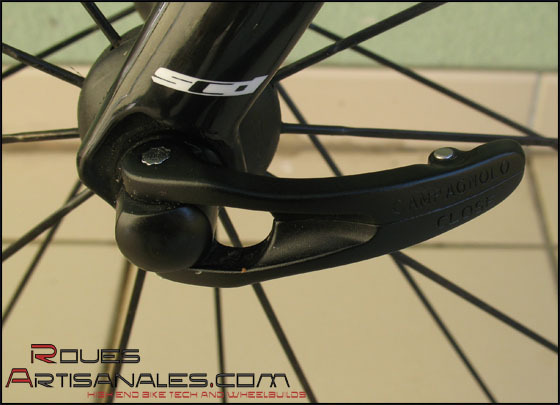 The rider and its bike’s weight thus push on the hub axis. The quick release only locks the wheel on the fork or on the frame to ensure accurate directions (imagine yourself cornering without having clamped the quick releases…). They make the bike and its wheels a single machine in case where the wheels would have to leave the ground. In theory, there are no bad quick releases since they all make the spinning components and the translationnal components a whole. In reality, some skewers gives a better safety impression. Weight is also very variable. Clamping feeling: The closure is very reassuring and ferm. The closed and opened positions are very clear. Opening: It’s easy but not too much. Miscellaneous: We regret the rotation of the lever only goes up to 90°. If it would rotate up to 180°, it should be much easier to manipulate it. Clamping strength: Excellent, it is distributed on a large surface thanks to an oversized washer. Clamping feeling: Perfect and reassuring, the titanium lever slides well on the anodised aluminium washer. Opening: Very easy, a little metallic noise appears sometimes during the loosening when the lever was too tight. version. Its spherical shape saves time: the lever doesn’t need a perfect alignment with the lever. Available in several colours. Clamping feeling: We have the unpleasant feeling of a loose lever even when it is closed as much as possible. The closed and opened positions are not clear. Opening: Very easy (too easy?). We feel the lever is opened with a very low force. loose feeling. 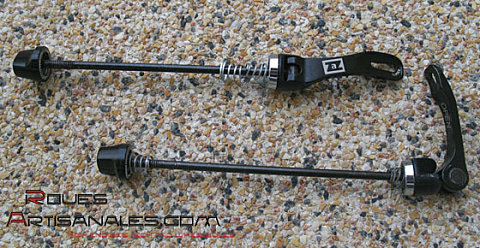 Although they’re efficient, Campagnolo skewers are very heavy and don’t provide a security feeling. 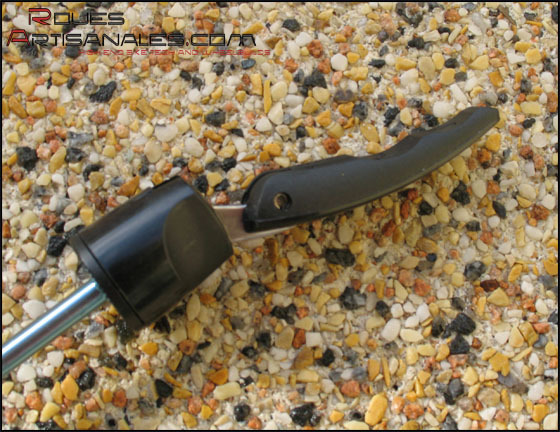 us choose the lever position without tightening the quick release. The lever can then be raised and rotated into any desired position. Ingenious. Opening: You just need to loose the system. Very easy. needs more time to tighten. 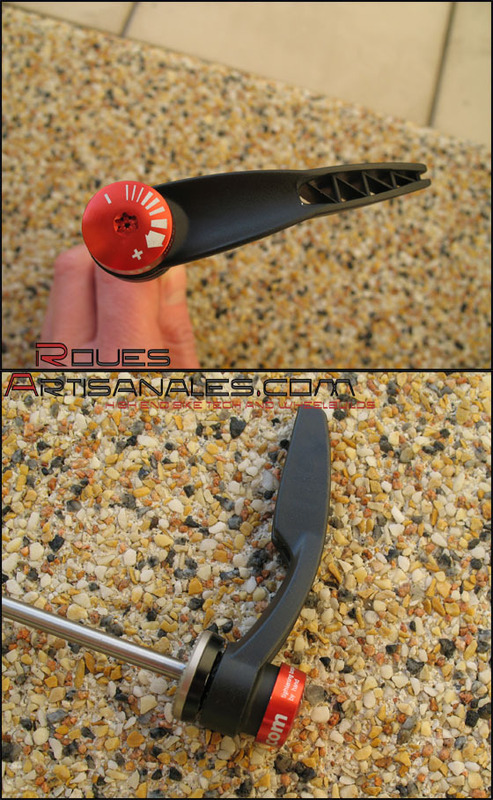 The lever is thick and bump against the fork during installation. Those who use frames with big clamps should be careful. Clamping feeling: Perfect and reassuring. 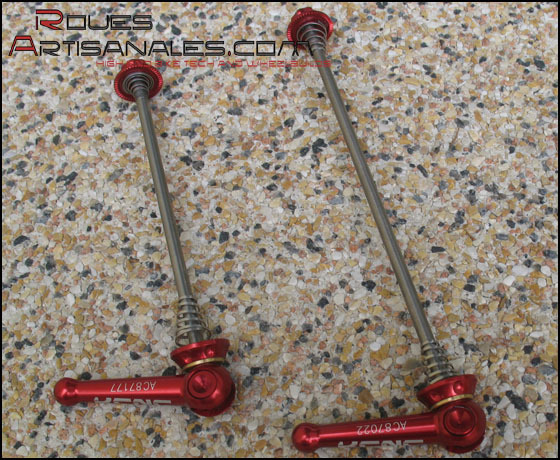 Miscellaneous: These skewers possess the same qualities as Carbon-Ti, a bit heavier but they stay very light. Also available in several colours. Very well finished and aesthetic product. Clamping feeling: Very good. Closing is very firm. Opening: Easy. 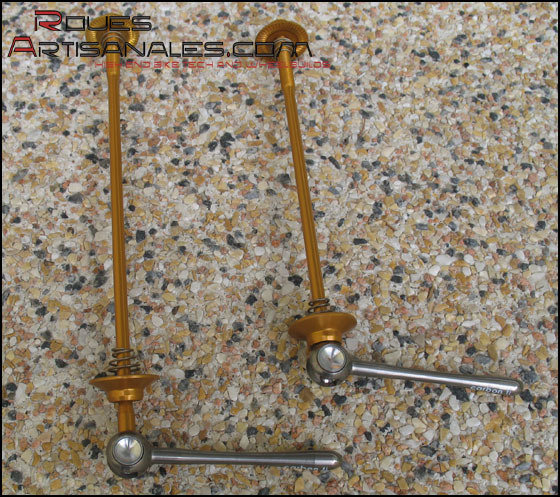 Here too, the large levers allow a good handling in order to make easy the skewers openings. Clamping strength: The clamping strength is excellent and optimised by the long levers. Clamping feeling: The clamping is reassuring and ferm. The closed and opened positions are very clear. Opening: The opening is simplified by the long levers. Miscellaneous: These quick releases are excellent. They fulfill perfectly their clamping function. Unfortunately they are a tad too heavy for the wheels they are delivered with. You may have understood, we liked the Carbon Ti the most. Beside being very light (the lightest skewers of our test), they are also the easiest to handle and one of the more efficient. They simply have all the advantages. Then, in second place, we would put the the KCNC, pretty close to the Carbon Ti, just a bit heavier, but as functional and pretty too. At first sight they were very promising, but the DT skewers disappointed us because they looked far more technical than they really are. 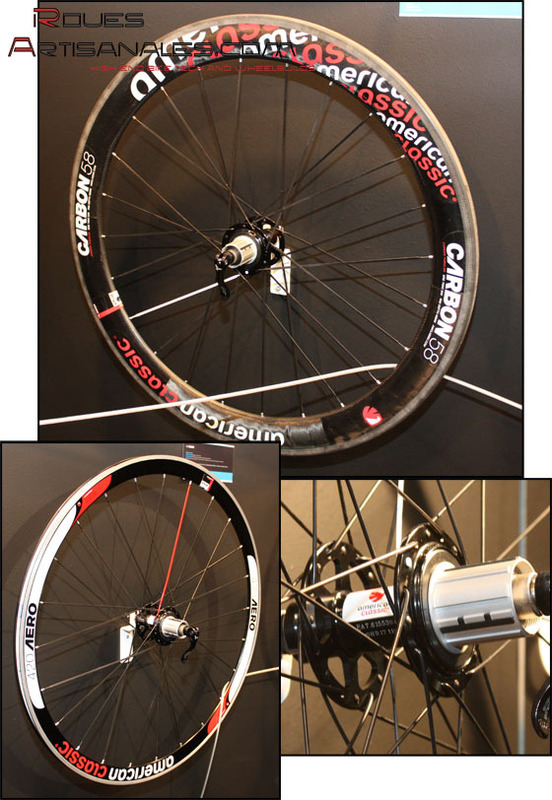 Campagnolo quick releases are not those we liked the most, we will keep them on our training wheels, in order to add some weight!. Concerning AMC, it’s a good product which is quite reliable, even if its technology is getting a bit older.